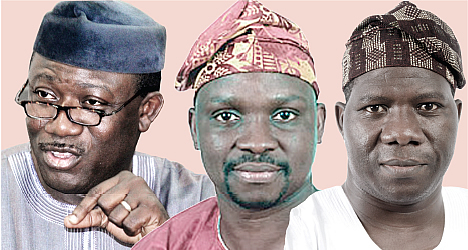 The past two months has been spent shuttling between the Ekiti state capital of Ado and Lagos. I incidentally was around in the thick of the campaign but like a smart Yoruba man that I am I had to quickly escape when the polity really got heated. However in the cause of my stay therein, I learnt certain things especially about the major contestants which would be shared below. Kayode Fayemi: Good man, did great things in the state but quite elitist and realized a little too late the power of the masses. Unlike Fashola in Lagos who focused on the elites while Tinubu took care of the masses, the Ekiti masses were politicaly left in the lurch. His strong points; his wife Erelu Bisi and some members of his cabinet especially the Chief of Staff, Yemi Adaralodu (who is a grassroot mobilizer). Some of his projects would also speak for him especially the stipends being paid to the elderly and his agricultural revolution with the youth. However his relationship with Tinubu would do more harm than good as the good people of Ekiti do not trust the opposition national leader. Ayo Fayose: The masses man, quite radical but present intent not entirely known. Bad antecedents but appears like a messiah to the masses now that Fayemi is scared of despite incumbency power. His strong points; GEJ, federal money, police, soldiers, Okada riders etc. Fayose is that trojan horse who would keep surprising Ekiti people. MOB – Bamidele: Confused man, obviously knows he can’t win but doing this because he has nothing to loose (remember his seat in NASS remains intact if eventually he looses). Strong points; Good speaker, support from Gov. Mimiko of Ondo, has some students support too but Ekiti people obviously knows he is a joker. The battle is a two-horse race between APC and PDP and its going to be a deadly battle as some families have over the past weeks been relocating until after the election. Fayose has been campaigning with bullet proof vest and only weeks ago, the governor was attacked while campaigning. Actors to watch out for: Musiliu Obanikoro (the new PDP hatchet man), unknown soldiers, INEC Staff (loyal to both divide), NSCDC officials (who would have a field day making arrests) and many more…. FINAL THOUGHT: Although I have no vested franchise in that state but atleast I can bare my thought as a Nigerian. Spending about a month in Ado Ekiti has revealed that Fayemi has done well but the people believe since money isn’t exchanging hands, he is not for the masses. Moreover his past squabbles with teachers and students of higher institutions would affect his bid. Furthermore Okada riders have been brainwashed that like Fashola did in Lagos, Fayemi would also ban their activities in lucrative areas of the state. Ekiti ‘ile iyi, Ile iye’ originally known as Fountain of Knowledge is well respected for its human resources especially in the education sector (Ekiti is reputed to have the highest number of professors in the country) and so it would be a great shock if a Ph.D holder who is globally renowned in war studies and conflict management strategies is substituted for a well known ‘abracadabra’ individual who is presently being accused of corruption and even murder. Infact the state would not just lose its respect amongst some of us but would have taken several negative steps backwards. However, politics is absolutely a funny game – a game of numbers. Let the people decide…that’s the beauty of democracy. In rapper, Olamide’s voice “shey ko wa le”?